The economy is growing due to unprecedented deficit spending by the government, fraudulent accounting by the Wall Street banks, the Federal Reserve buying $1.5 trillion of toxic mortgage “assets” from their Wall Street owners, various home buyer and auto tax credits and gimmick programs, and Fannie, Freddie, and the FHA accumulating taxpayer loses so morons can continue to purchase houses. Jobs are being created. According to the BLS, we’ve added 951,000 jobs since December 2009, an average of 79,000 per month. Of course, the population of the US is growing at 175,000 per month. 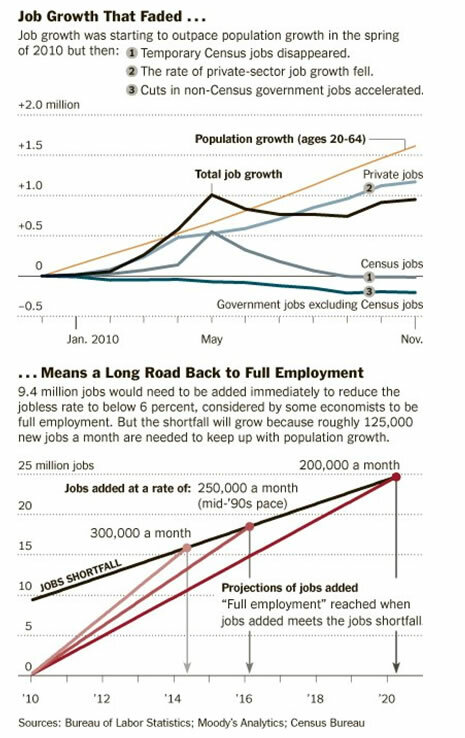 It seems that there are millions of jobs being created, just not here as shown on these graphs from the NYT. The storyline of corporate profits is true. As a percentage of national income, corporate profits are 9.5%. They have only topped 9% twice in history – in 2006 and 1929. When you see the paid Wall Street shills parade on CNBC every day proclaiming the huge corporate profit growth ahead, keep these data points in mind. 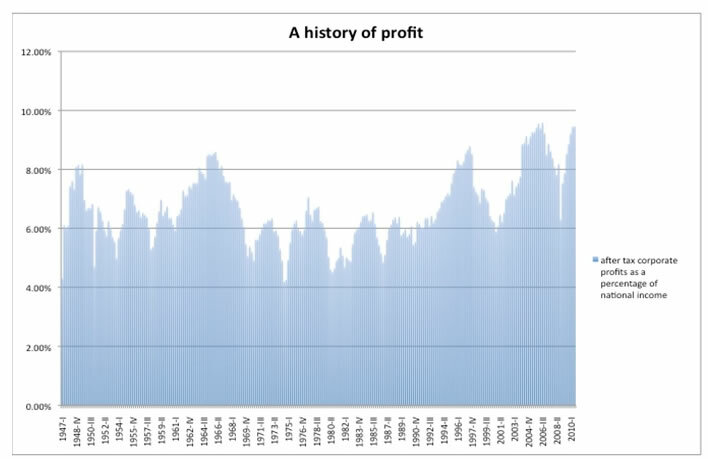 Do profits generally rise dramatically from all time peaks? According to BEA data, financial industry profits and “rest of world” profits, the money U.S. based corporations make overseas, are relatively much higher now than they were in the 1950s or 1960s. And the taxes paid by corporations are much lower now than they were then, as a share of national income. The reason that corporate profits are near their all-time highs is that Wall Street corporations and mega multinational corporations are making gobs of loot and paying less of it out in taxes. Isn’t that delightful for the CEOs and top executives of these companies? The profits are being generated on Wall Street through collusion with the Federal Reserve, as the insolvent Wall Street banks accept free money from the Federal Reserve to generate speculative profits at the expense of senior citizens earning .20% on their CDs. The mega-multinationals are “earning” their profits by continuing to ship American jobs overseas at a record pace. The Economic Policy Institute, a Washington think tank, says American companies have created 1.4 million jobs overseas this year. The additional 1.4 million jobs would have lowered the U.S. unemployment rate to 8.9%, says Robert Scott, the institute’s senior international economist. “There’s a huge difference between what is good for American companies versus what is good for the American economy,” says Scott. The hollowing out of the American economy has been going on for decades and despite the usual rhetoric out of Washington DC, it continues unabated today. But consumer spending has surged, so the recovery must be solid and self-sustaining say the brainless twits on CNBC. Consumer spending is rising because the top 1% wealthiest Americans are doing splendidly as they are now reaping 20% of the income in the country, levels last seen in 1929. The Haves have more, the Have Nots have less. The top 10% wealthiest Americans own 98.5% of all the stocks in the country. They feel richer because Ben Bernanke has propped up the stock market with trillions of borrowed money from future generations. The other 90% of Americans have stagnant or non-existent wages, rising costs for fuel and food, falling home prices, rising debt levels and little hope for the future. They have been thrown a bone of extended unemployment bennies, a temporary payroll tax cut, and extended tax cuts. Any spending they are doing is on credit cards as the austerity deleveraging storyline is another big lie by the MSM. The figure of 15 million unemployed reported by the government and regurgitated by the corporate media is one of the biggest lies in the history of lies. The real figure is 30 million and I will prove it using the government’s own data. I created the chart below from BLS data (ftp://ftp.bls.gov/pub/suppl/empsit.ceseeb1.txt) to prove that we are in the midst of a Greater Depression and no amount of spin by politicians and the media can wish it away. When we look at jobs in America across the decades, a picture of a country in decline, captured by financial elites, reveals itself. In 1970, America still produced goods, ran trade surpluses, and paid wages that allowed families to thrive with only one parent working. Only 34.6% of the population was employed, with a third of these workers producing goods. Whether it was due to the woman’s movement of the 1970s or due to financial necessity, the percentage of the population employed grew relentlessly until it reached 46.8% in the year 2000. The level of 46.8% meant that when the opportunity to be employed was available, this percentage of Americans wanted a job. Since 2000 the population of the U.S. has grown by 28.9 million people. The labor force between the ages of 18 and 64 has grown by 26.1 million people since 2000. The government insists that millions of Americans have chosen to “leave the workforce” and should not be considered unemployed. This is laughable. Why would people choose to leave the workforce when wages are stagnant, retirement looms, prices relentlessly rise, and they are drowning in debt? The truth is that at least 46.8% of the population wants to be employed. That means that 145.2 million Americans would be working if they had the chance. Only 130.5 million are currently employed. This means that there are really 30 million Americans unemployed versus the 15 million reported by the government and MSM. Not only is the country short 30 million jobs, but the type of jobs reveal a country of paper pushers, consultants, temp workers, government drones, waitresses, and clerks. The chart below shows the distribution of jobs through the decades. In 1970, jobs in the goods producing industries made up 31.2% of all jobs. Today, they account for 13.8% of all jobs. The apologists will proclaim that corporate America just got phenomenally more efficient and productive. That is another falsehood. In 1970, we were a net exporter, consumer expenditures accounted for 62.4% of GDP, and private investment accounted for 14.7% of GDP. Today, we consistently run $500 billion to $700 billion annual trade deficits, consumer expenditures account for 71% of GDP, and private fixed investment is a pitiful 11.5% of GDP. We’ve degenerated from a productive goods producing society to a consumption based, debt fueled society. This is a classic late stage trait of declining empires. Rome and Britain before us experienced similar declines. The most damning facts that can be garnered from the BLS data relate to how we’ve become a nation of bankers, real estate agents, accountants, lawyers, tax specialists, and fast food fry cooks. Manufacturing jobs have dropped from 25% of all jobs in 1970 to less than 9% today. Jobs in the spreadsheet generating, credit default swap creating, subprime mortgage pushing, frivolous lawsuit filing, tax evasion sector of the economy went from 12% in 1970 to 19% today. The well paying goods producing jobs are never coming back. American manufacturing jobs have been shifted overseas for more than two decades by corporate America. Now those jobs have become more sophisticated, like semiconductors, software and even medical and finance. The American middle class is relegated to being McDonalds fry cooks, Wal-Mart greeters, and temp workers. What has happened to the American middle class was not an accident. The wealth of the country has been pillaged by an elite group at the very top of the economic food chain, who were able to reap the rewards of globalization (outsourcing American jobs), manipulate the debt based financial system through synthetic fraud products, and avoid taxes by hiring thousands of lawyers, accountants and tax consultants. When you hear that the rich need lower taxes, corporate taxes are too high and increased productivity is great for America, remember what they have done to the country since 1970. If corporate America and its leaders continue to reap obscene profits while the middle class falls further into the abyss, societal unrest will beckon. 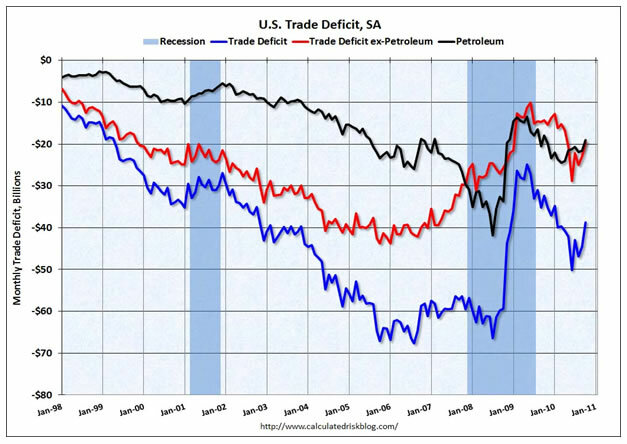 I have no proof, but I feel sure that the effect of the coordinated lies and manipulative actions of the Fed and the US federal government are mainly two: 1) Pushing the eventual and inevitable collapse of the US economy and empire further out into the future. 2) Greatly increasing the severity, seriousness, duration, and amount of permanent damage of the collapse when it does occurs. We have a government that is short-term wise, but long-term extremely stupid. Is it any wonder that the American people are completely losing faith in their government, news reporting services, and other institutions? It's probably impossible at present to predict when the collapse will begin and how abrupt the decline will be, but it is hard to believe that the present system can endure more than ten years. Meanwhile, our government continues trying to make things better by making them worse, and trying to solve its debt problem by borrowing more money.